With features including HD Voice and noise-cancelling technology, this reliable two-line SIP phone delivers an unparalleled communication experience at an affordable price. With a backlit LCD screen, shared line appearance, three-way conferencing, call waiting and easy call transfer, this entry-level enterprise phone is the perfect solution. 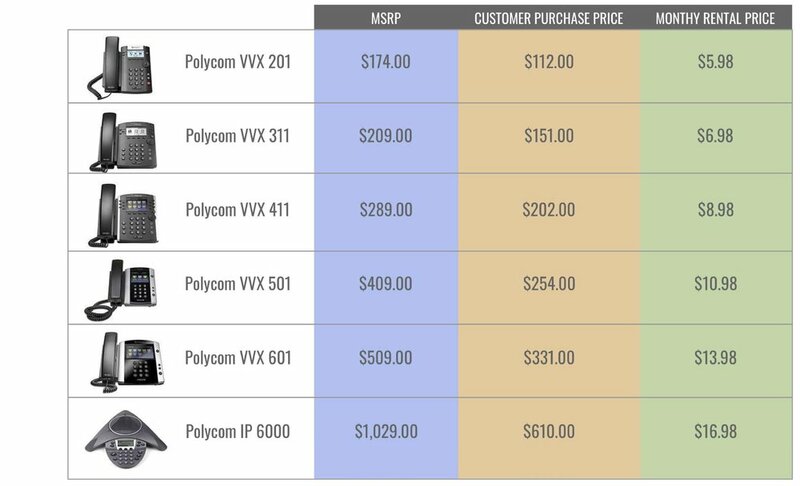 The Polycom VVX 501 is a high-performance 12-line business media phone with superior voice capabilities. Designed for a broad range of office sizes, the VVX 501 seamlessly integrates with Nextiva's features for improved productivity and a wide range of applications. The device features a touch screen interface, calendar integration, expandable accessories for video and wireless, and unified communications software to connect with PCs. The powerful Polycom VVX 301 is an entry-level business media phone that is ideal for busy offices that need crystal clear communication. This six-line phone offers Microsoft integration, handset and headset compatibility, Busy Lamp Field and Shared Call Appearance capabilities, distinctive incoming call treatment and more. The premium Polycom VVX 601 is ideal for executives and managers who need intuitive and powerful connectivity to lead an organization. Featuring a high resolution screen and 16-lines, the VVX 601 has the ability to provide personalized information through built-in web applications and a digital photo frame. An optional camera quickly gives the device video conferencing capability and the web-based tools allow for increased productivity. The expandable Polycom VVX 401 is a colorful business media phone that is ideal for offices with moderate call volume thatneed advanced UC telephony features. The 12-line phone offers Microsoft integration, HD voice quality, Busy Lamp Field and Shared Call Appearance capabilities, distinctive incoming call treatment and more. The T19P E2 is Yealink’s entry-level IP phone that offers features and performance normally associated with more advanced phones. The use of high quality materials, combined with a large 132 x 64 pixel graphical LCD that gives a clear 5-line display, guarantees both a smooth experience and easy access to a wealth of visual information at a glance. 10/100Mbps network ports with integrated PoE are ideal for extended network use. The T48S is an elegantly designed IP phone for executives and busy professionals. The large, 7” coloured touchscreen provides rich visual presentation and simple navigation through a wealth of productivity enhancing features. The SIP-T41S is a feature-rich business tool for superior communications and extended functionality. It offers a faster, more-responsive interface than the T41P and several performance-enhancing functions. Choice of power options - Can be powered via Power over Ethernet (PoE). Can also be powered by OPTIONAL universal power supply. Power supply is only needed if PoE is not available on your network. The Yealink W60 Package, being a high-performance SIP cordless phone system, is the ideal solution for small and medium-sized businesses. Paring with up to a total of 8 Yealink W52H/W56H DECT handsets, it allows you enjoy superb mobility and flexibility.